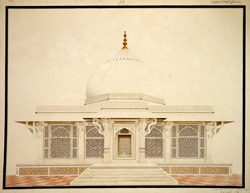 Watercolour by Latif (fl..1820s) of the Mausoleum of Salim Chishti at Fatehpur Sikri in Uttar Pradesh, dated between 1820 and 1822. The image is inscribed on the front in English: 'Tomb of Sheik Selim at Futtipoor'; and in Persian characters: 'Raudah i munauwarah i hadrat Shaikh Salim Chishti ba-maqam i Fathpur Sikri 'amal i Latif' (The illumined tomb of the saint Sheikh Salim Chishti at Fatehpur Sikri. The work of Latif). The Mughal Emperor Akbar built his palace-city complex at Fatehpur Sikri on the site of Shaikh Salim's residence in honour of the saint's prediction of the birth of Akbar's heir, Prince Salim, who later became the emperor Jahangir. Shaikh Salim was a member of the Chishti order of Muslims saints or 'pirs'. Akbar would have consulted him on both religious and secular matters. The tomb is situated in the 'sahn' or courtyard of the congregational mosque, behind the impressive Buland Darwaza gateway. It is a single-storey building comprising a central square chamber with a surrounding covered passageway enclosed with carved pierced screens and an entrance to the south. In style the tomb is influenced by earlier mausolea in Gujarat of the sultanate period. The building is ornamented with white marble serpentine brackets supporting sloping eaves around the parapet and carved pierced screens of geometric design.